Ernst's Economy for you: PGC versus Procom D.U., Pt II: Spanish justice: “SNS Property Finance illegally conveyed money from PDU to The Netherlands”. This PDU money had been embargoed to settle a long-term amount due of PGC. PGC versus Procom D.U., Pt II: Spanish justice: “SNS Property Finance illegally conveyed money from PDU to The Netherlands”. This PDU money had been embargoed to settle a long-term amount due of PGC. Is SNS PF also guilty of using a straw firm, in order to hide their substantial financial losses in PDU?! This is the second part of my exclusive interview with CEO Jaafar Jalabi of Parcelatoria Gonzalo Chacón (PGC). I wanted to get paid. Procom said: "We have no money to pay you". Subsequently, I blocked all their accounts and on these accounts combined stood a total of €304(!). So I put an embargo on some assets. One of the assets I put an embargo on, was a shopping centre in Zaragossa. This shopping center in Zaragossa was owned by a subsidiary of Procom, ‘Procom Desarrollos Urbanos de Zaragosa’. From this company, 50% of the shares were owned by Procom (PDU) and 50% by Cecosa, the holding behind the renowned group ‘Eroski hypermarkets’. I put an embargo on the 50% of the PDU Zaragossa shares, owned by PDU and I wanted to put it out for being auctioned. I went to meet Eroski and asked them: "What is going on with SNS PF"? They said to me: "We don’t know?! Procom just received a lot of money from the Bank of Ireland”. You must know: initially the shopping centre in Zaragossa was supposed to be sold to the Bank of Ireland. However, due to the real estate crisis in Ireland, the Bank of Ireland couldn't pay this money anymore. Subsequently, however, PDU went to the Spanish court and collected a huge amount of money from the Bank of Ireland after the lawsuit had been finished. PDU didn’t have this money from the Bank of Ireland wired to a PDU account in Spain; this would have been the legal way to go, since it was PDU which collected the money as damages in Spain and from a Spanish court, to be specific. Instead, PDU told the party that was paying the money, to divert the payment to an account of SNS Property Finance in The Netherlands: at the Royal Bank of Scotland. 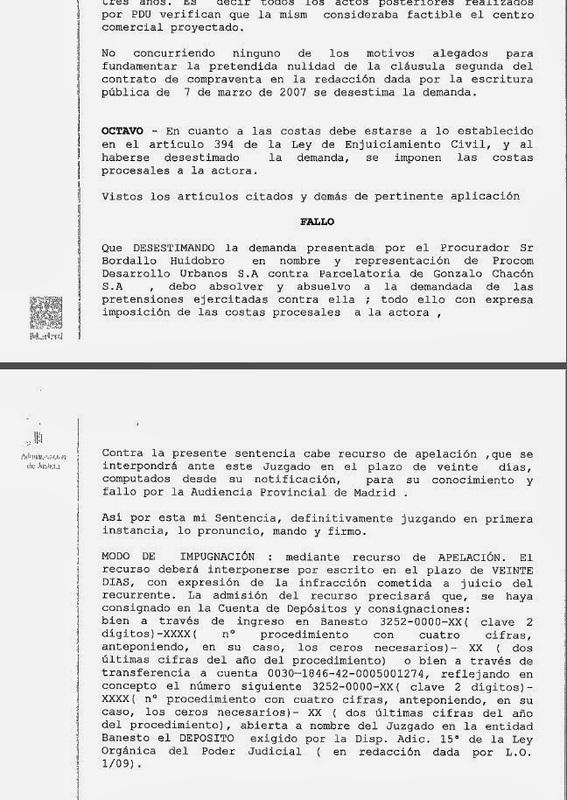 The reason was that the accounts of PDU in Spain were embargoed by PGC; any money that would be booked on these accounts, would also be automatically embargoed. Since PDU and SNS PF did not want to pay PGC it's money, they illegally diverted the money to an SNS PF account in The Netherlands, instead of passing it through a Spanish PDU account first. I investigated the whole thing to see where the money went, so I found out that the money had been wired directly to SNS PF in The Netherlands on an account of the Royal Bank of Scotland, of which I have the number. 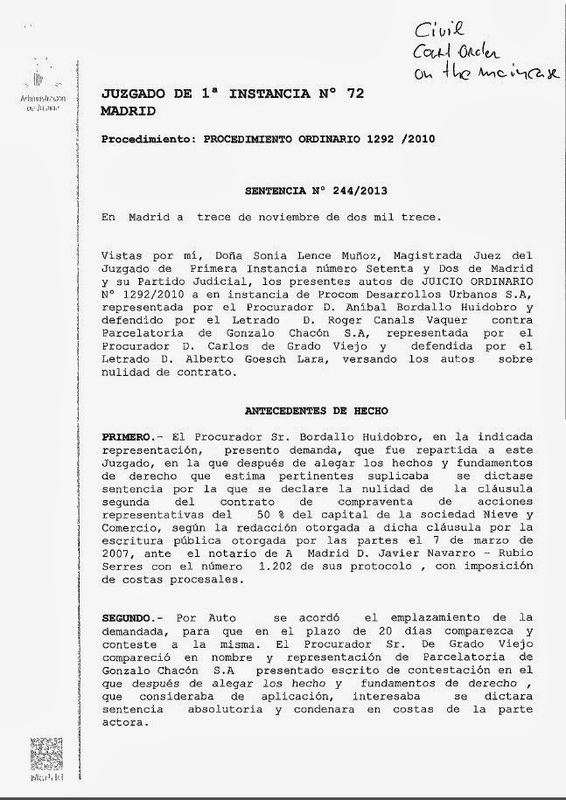 Spanish Court order of embargo 1. 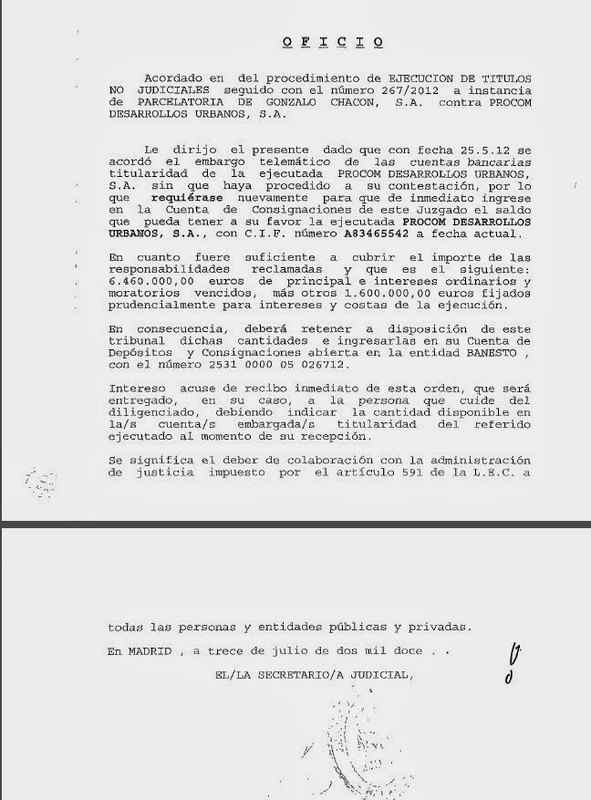 Spanish Court order of embargo 1I. 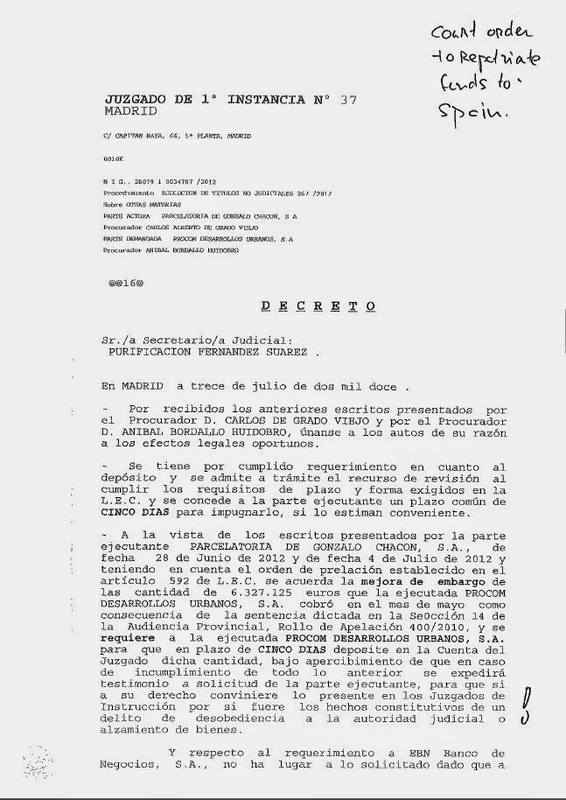 Spanish Court order of embargo 1II. 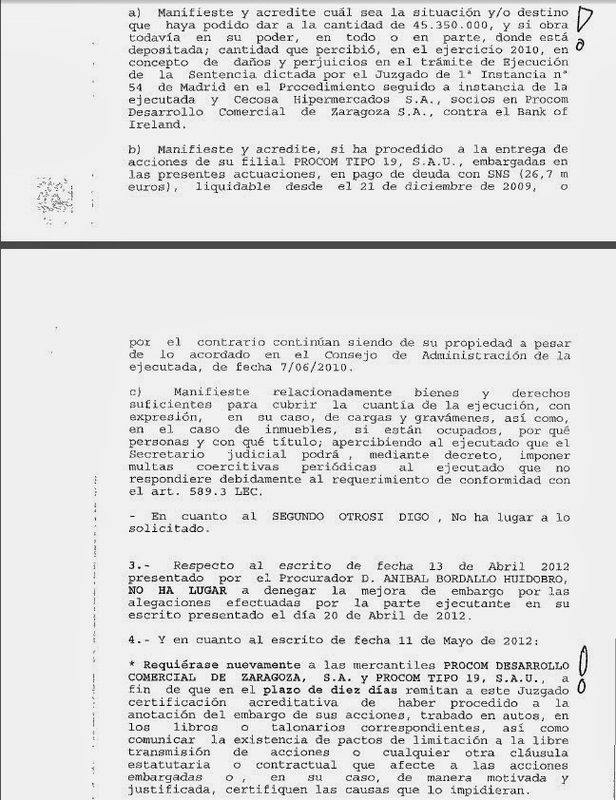 These are the court orders to embargo the assets (see the aforementioned pictures). criminal conveyance of assets (embezzlement of money). After receiving this court order, PDU paid the money directly to the court. However, in the meantime, the sum had increased from €6.46 million to €8.06 million. The amount to pay by PDU, had increased as a consequence of the delayed interest payment and legal costs. The court gave me the €6.46 in September 2012, but after serious pressure by PDU and especially SNS Property Finance, a criminal case had been admitted in the meantime. The exact amount of damages was supposed to be negotiated between PDU, PGC and the court. This would happen after the criminal case had been dismissed. Now I will tell you more about the criminal lawsuit: SNS PF and PDU admitted a criminal case against Jaafar Jalabi and against José Arenas Ural, the former chairman of PDU. I have proven to the court that I had so many problems with Arenas, that we had 50 negative letters exchanged between us, al through public notaries and registered mail. Still PDU and SNS PF raised the criminal case against Arenas and me. Meanwhile, when PDU put an injunction on my notes payable, this was part of a civil case. Procom wanted from the judge that the change we made earlier in 2007 - changing the payment date for the last instalment of the €6.46 million from the opening date of the Snowdome to the fixed date in 2011 - would be nullified. The criminal case opened, but it didn't automatically stop the civil case. The criminal case was against me as a person, while the civil case was between my company and PDU. Finally, the civil judge in the main case (in November 2013) issued a court order that PGC was in the right and that PDU really had nothing to build their case upon. That was the third lawsuit that they lost. The criminal lawsuit had not passed yet. The criminal judge had studied the documentation thoroughly. You must know, in Spain a criminal judge either takes a case to trial, or dismisses it. The dismissal has one or two forms: in 95% of the cases, the dismissal is provisional, which means that the case is closed, unless more evidence emerges. In my case, however, the criminal judge definitely closed the case and dismissed me of all charges. Today [Wednesday, February 12 – EL] was the last day for appeal, but they have no chance to win the case whatsoever. Our written statement, in which we requested to dismiss the criminal case was 35 pages and we had some 3000 pages in supportive documentation. Their response was 3.5 pages in which they stated that they wanted to continue the case against Arenas. They didn't even mention my name in it. When they don't appeal today, I can start to claim my damages from PDU and SNS PF. I have written so many times to different people at SNS PF. 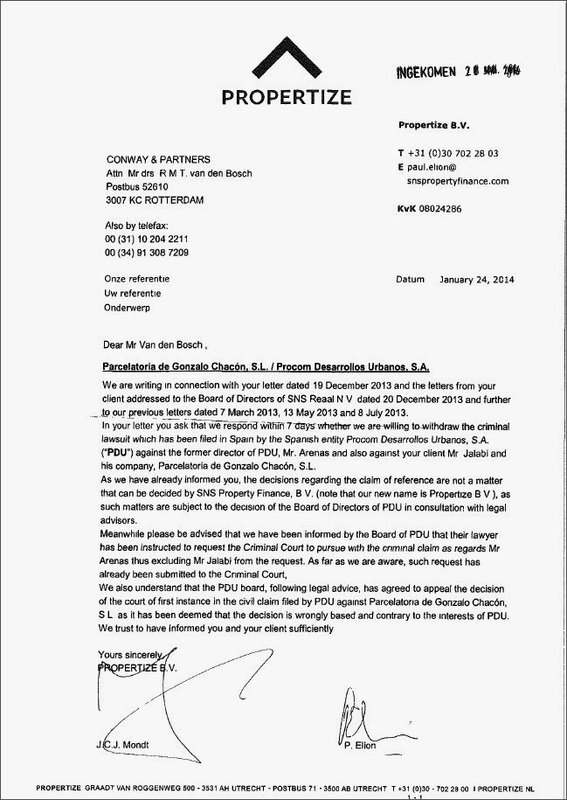 These are registered letters from January 2012 to Buck Groenhof, the chief restructuring officer. I said to him: "What you are doing is a crime”. I didn't get a response from him at all. I wrote the same letter at Jaap van Dijk, who was the CEO of SNS PF. He also didn't respond. Finally, I wrote the third letter to Ernst Jan Boers, the CEO of SNS Bank. SNS Bank owned SNS PF for 100%. If you look at the balance sheet of SNS Reaal: they have given a global guarantee for SNS Bank (art. 403 of the Dutch Code) and SNS Bank has given a global guarantee to SNS PF (this is the same article 403). This is why I wrote to SNS Bank. However, nobody did anything... I wrote them in January 2012. In February 2013, when the whole SNS Reaal group was nationalized, I wrote again letters to the new people at SNS Reaal: Gerard van Olphen and Maurice Ostendorp. I wrote them letters in February 2013 after the nationalization to do something about the false claims and the criminal investigation against me. In December, after the civil case ended, but before the decision in the criminal case had been made, I wrote them again. Letters to Van Olphen, Ostendorp and another person were sent through the bailiff. Their answer was [see the aforementioned letter] that it was not their responsibility: “It was a Spanish decision and we have nothing to do with it”. This is nonsense and I will explain you why: in 2009 the net worth of PDU was approximately - €50-odd million. In 2010 it was - €100-odd million. In 2010, SNS bought the 10% shares in Procom(PDU) from one of the Spanish shareholders. SNS PF bought this 10% of Procom for €1 (! ), as the real value of the company was negative. They also bought the stake of Albert van S. – probably for €1. Since I have proof that SNS PF bought 10% of PDU for €1 in March 2010, it is logical to assume that SNS PF bought the additional shares for €1 too. Summarizing, in 2010 SNS PF was the full owner (100%) of Procom. After this happened, however, the people involved decided to protect SNS PF from the risks of full ownership of PDU. SNS PF kept a 48% stake in PDU, but "sold" a 48% stake to another company. The 4% of the remaining shares, was sold to different persons, who were all under control of SNS PF. The Spanish company that bought 48% of Procom from SNS Property Finance, later on in 2010, bought these shares for an unknown nominal value. Nevertheless, this company had an equity capital of just €15,000. This is such a low capital, that it is silly to assume that they are the real owners of the shares. Instead, they are fronts for SNS PF: a genuine straw firm. Moreover, the board of directors of Procom, which includes representatives of the 48% buyer, would never assume the legal responsibility for Procom, without having before hand all sorts of guarantees from SNS PF, that it will be responsible for everything that happens in Procom. The responsibility of SNS PF is now in reality the responsibility of the Dutch State. However, the question is: why did these people build up this construction with this supposed straw firm?! I will explain you. You should take the current accounting rules [IFRS: International Financial Reporting Standards – EL] into consideration. If SNS PF (i.e. SNS Bank) would have owned 50% or more of the shares in PDU, they would have been obliged – by these accounting rules – to consolidate the balance sheet of PDU into the SNS Bank's balance sheet. This would mean that the losses of PDU would also have been consolidated. Instead, they wanted to hide the losses of PDU! This is very illegal, you know. They changed the board of PDU: until and including the year 2010, the board of PDU consisted of all SNS people. Afterwards, the board consisted of SNS PF itself and people from Directores de Transicion and there were two other people, who were representing the other 48%. The value of PDU in 2010 was none, when 10% could be bought for €1. Still, the people of SNS PF have created a lot of financial damage with me. Against the € 6.46 million Note Payable by PDU to Parcelatoria Gonzalo Chacón(PGC), PGC borrowed € 5.5 million. 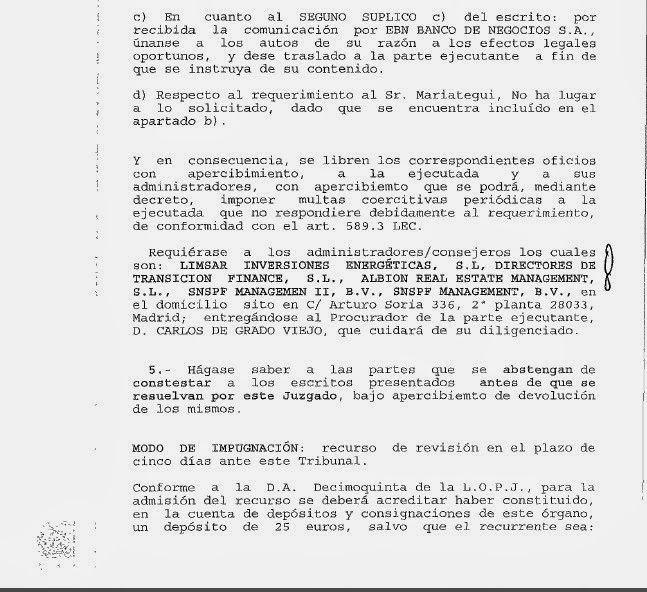 The bank from which PGC borrowed this money, sent PDU a letter through the public notary. that the bank had accepted the 2007 Note Payable by PDU, given to PGC, as a guarantee (security). 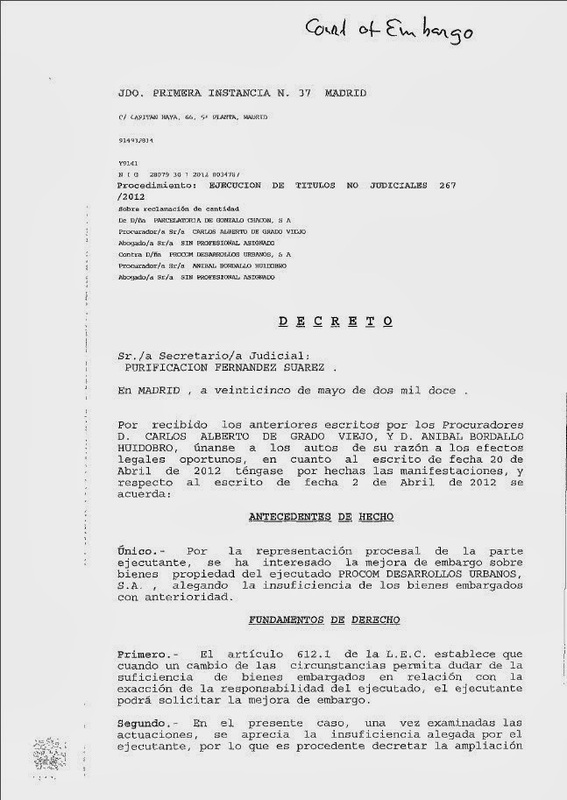 The public notary has issued a public document, showing that PDU received this letter in February 2008 and showed the signature on the receipt. However, once SNS PF took over the control at PDU, their position has been that PDU never knew about the existence of the 2007 agreement until 2010. [At this moment, Jaafar Jalabi showed me the aforementioned document – EL]. They stated that the board of Procom didn't know that the first contract – stating that the final instalment of €6.46 million, for the sale of PGC’s share in the shopping center in Valencia, had to be paid by PDU to PGC right after the opening of the Snowdome – had been changed into the second contract, stating that the €6.46 million final instalment had to be paid in at a fixed date in 2011. This is a clear lie. 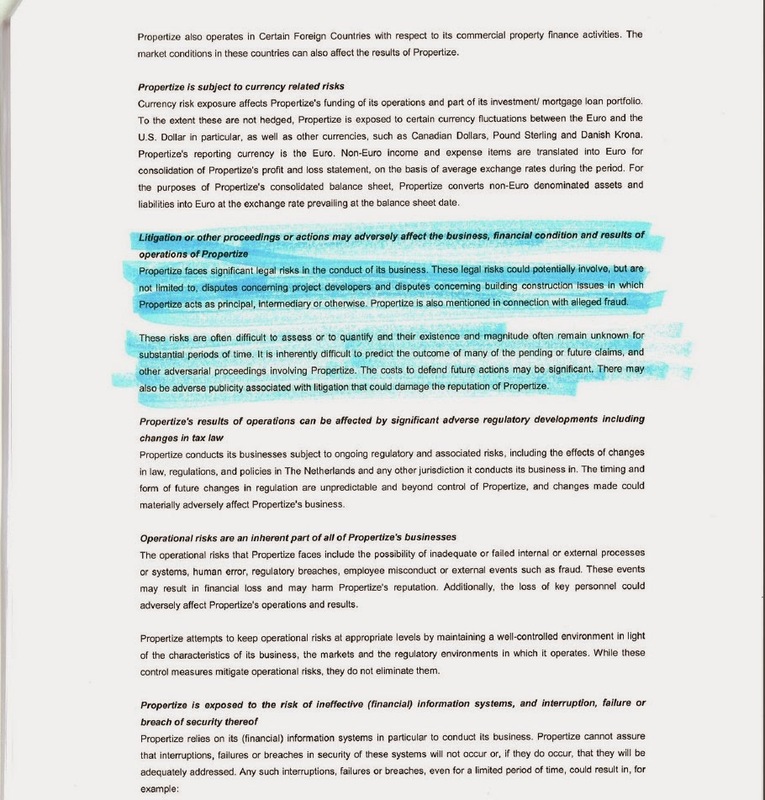 Procom received this information on 11 February 2008 through a notarized document. So, how can you claim that you didn't know about the existence of this very document, when you received it in 2008. The trial was in 2010, remember?! This is why I've been winning everything: it is because their claims are nonsense! Unfortunately, when Procom put the injunction on my 'note payable' of €6.46 million, I was told by the bank which borrowed me the money, that they now didn't have a guarantee anymore. They charged me to pay them back the €5.5 million, that I borrowed. I had to start selling assets to pay back the bank and lost a lot of money on it, in the process. Moreover, when the injunction was lifted from the ‘note payable’ in 2012, they started to play games with me, that they didn't have the money anymore and so on. I only collected the money in September 2012. When they said to me earlier that they didn't have money, I understood that I wasn't going to collect the money soon. Consequently, I was forced to sell more and more assets, you know?! In reality, they had collected the money from the Bank of Ireland, but they immediately wired this money to SNS PF in The Netherlands (see the aforementioned paragraph). All of this is highly illegal and it can have criminal repercussions. Last week, I have written a letter to the Dutch Finance Minister [Jaafar has showed me this actual letter and he will give me a hard copy at a later date – EL]. I can only give it to you at a later date. I sent it through the bailiff, but I didn’t yet receive an official receipt from the Dutch Finance Ministry for this letter. SNS Reaal is owned by NLFI (NL Financial Investments), also the owner of ABN Amro. In reality this is the Dutch state. NLFI currently owns ABN Amro and SNS Reaal. 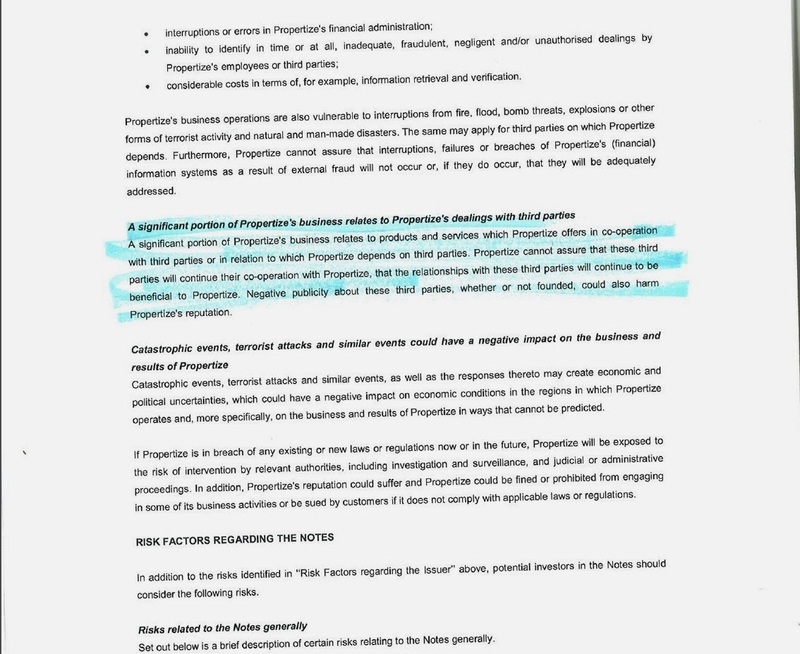 NLFI has actually shifted SNS PF away from the other legal entities and renamed it to Propertize BV. This means that Propertize is now directly owned by NLFI (i.e. the Dutch state), as a kind of ‘bad bank’. Two weeks ago, Propertize wanted to raise €4.056 billion from the market. In fact, they tell the people that they are bad people in a sense. I presume that the Dutch Finance Minister has made checks and balances on how these people ran their business. What is happening now actually, is that SNS PF are hiding some serious wrongdoings, which are going to cost the Dutch taxpayer more money. The problem is that Buck G. has established a system of lawsuits and that the lawyers, who represented SNS PF in these lawsuits, paid him kickbacks. Who will be paying in the end for all of this: the Dutch state. I am going to claim ‘suffered damages’ from Procom and SNS PF, as I have proof that the latter controlled Procom at the time. In the end, however, it is the Dutch state that will foot the bill. The problem is now, that I am the only one who has the legal right – as a consequence of this criminal case they started against me – to go against them at the criminal court. I have proof that they have been hiding and playing all sorts of games. I don't want to go criminally against them, however: this is why I wrote to the Dutch finance minister to please solve this case. I am going to prepare a letter to NLFI. "You can easily say that you are the owners of Propertize, but you are not the managers. The new people, who run Propertize, are continuing the crime which was started by Buck G.”. My legal battle is in Spain, but it will have implications on the people who are working for the Dutch government. It is bad when the Dutch Minister of Finance is trying to teach the Spanish and Cypriot people a lesson about sobriety, austerity and the recklessness of their banking systems, when a Dutch bank is committing crimes against me. I don't want to be involved in politics. My objective is to tell the Dutch people, that the clean up of SNS PF has not been executed the way it should. It will cost the Dutch citizens more and more money. The people of Propertize have no room to breath, when they fight against me. I am 100% rock-solid in this matter. What happened, when Buck G.'s people put an injunction on the notes payable, was the following. G.'s people talked to my lawyer and stated that they wanted to pay me only €1.5 million on my €6.46 million claim. I told them to get lost! When I started getting the documentation through court and so on, G.'s people told my lawyer that they wanted to pay me €4 million. I said: "Get lost". It is an issue of moral conduct. They cannot do so! I suspected that the way that things were supposed to happen, was that they paid me €4 million and G.'s people would put the other €2.5 million in their own pocket. I said "I have notes payable and SNS PF is supposed to pay me". Tomorrow, the third and final part of the interview with Jaafar Jalabi will be printed.